The prestigious Dutch yard Royal Huisman shares more details about their latest order, the 43.31m sailing yacht Blue Papillon. With a contract signed last year, the construction of the all-aluminium Blue Papillon started at the end of 2010. 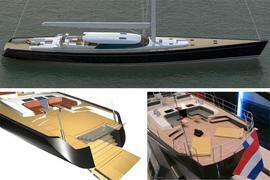 She's a contemporary but ageless sloop with a low profile deckhouse. The Argentine designer German Frers is responsible for the exterior design, while the interior is styled by Rhoades Young Design. The interior accommodates eight guests. The full-beam master suite aft is linked outside to a private cockpit making this area a real beach deck thanks to a retractable bathing platform. The other guest cabins are a double and a twin aft and a convertible one forward of the deckhouse. On the technical side below the waterline, Blue Papillon has a moderate fixed bulb keel and a deep carbon rudder. Above, she will have a full carbon Rondal rig giving an air draft of 57.35m. The main engine will be a single 533kW Caterpillar C-18. Blue Papillon is scheduled for a delivery in 2013.